It is an undisputed fact in the Potter fandom that the Weasley family is the best family in the wizarding world. It is impossible not to admire their deep and abiding love for each other, the ferocity with which they fight for each other, and their readiness to accept anyone and everyone into their fold. The whole Weasley family – Molly, Arthur, and seven children – was Sorted into Gryffindor at Hogwarts, and they are united by their shared Gryffindor values of courage, loyalty, and leadership. However, the unique strengths of each Weasley taken together represent the best Gryffindor has to offer. In a culture steeped in pure-blood prejudice, Arthur openly delights in Muggle innovation and works hard to ensure Muggles get the respect they deserve. Though his vocal support for Muggle rights gains little respect from the likes of Lucius Malfoy and Cornelius Fudge, Arthur earns the admiration of many of his Ministry colleagues. Arthur is brilliant, open-minded, hard-working, and kindhearted; his children learn from him to be nothing other than their most authentic selves. 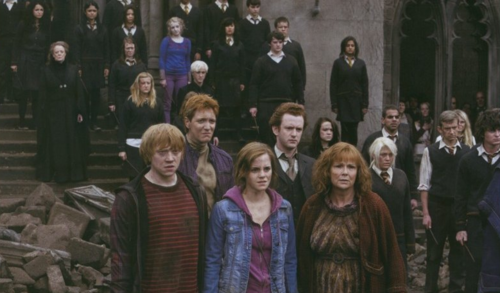 All of the Weasley siblings, especially the youngest, look up to Bill as their role model and trust his judgment. To Ginny, Bill’s word is final, and when Ron abandons Harry and Hermione, he goes to stay with Bill because he knows Bill will understand how ashamed and sorry he is more readily than the rest of his family might. Bill even manages to gain the respect of his goblin colleagues at Gringotts, who notoriously don’t trust wizards. Bill is a solid figure for his family to depend on. We first hear from Charlie when he agrees to help his youngest brother smuggle Hagrid’s illegal baby dragon out of the castle. Charlie is well known and admired at Hogwarts for his talent and compassion for animals. He strongly cares about the dragons he works closely with, expressing concern for how they are being used in the Triwizard Tournament. Charlie is close to all his siblings and a good friend to Hagrid and Harry; from what we know of him, he is always ready to help those who need him. Fred is lively, spontaneous, and brilliant, an exuberant dancer and a spectacular showman. He is perhaps slightly more stubborn and vindictive than his twin and tends to take the lead in whatever pranks and adventures they plan. He forms fierce friendships and clings tightly to those he loves – he was most upset by Percy’s estrangement but also the first to forgive him. Fred shares his twin’s warmth and his passion drives their ideas forward. George is every bit as brilliant and creative as his twin, but he is perhaps the more thoughtful of the two. He shows slightly more restraint in his pranks and insults than Fred does and seems to keep their ideas grounded. George is a true friend to anyone who needs one and a fiercely protective sibling, especially to Ginny, Ron, and Harry. He shares Fred’s passion, and their combined talents “turn on the light” in a dark wizarding world. Ginny has an abundance of talent and a formidable spirit, and once she becomes more relaxed and comfortable with herself, it doesn’t take long for the whole of Hogwarts to sit up and take notice of her. She never gives up on herself, her family, or Harry. Ginny has the nerve to challenge every expectation of her and defy the trauma she endured at Voldemort’s hand. Ginny has hope that she and her loved ones will see a bright future together, and she fights for that hope throughout the war. Love is Molly’s greatest source of power. To her family, friends, and anyone who walks into the Burrow, Molly offers warmth and comfort. Harry is another son to her from the moment they first meet. To those who would threaten her family, she is a scorching, ferocious adversary. Her children inherited her strength, kindness, and tremendous capacity to love. Percy works hard and is a fearless leader, eager to set the best example he can for his younger siblings. He carries the heavy weight of his personal expectations with him always. Percy dearly loves his family, but when he is generously given a second chance by Fudge after his career is shattered, Percy puts his faith in the Ministry and does his family a grievous wrong. When he realized that he had made a grave mistake, he shed his pride and begged his family’s forgiveness. As Percy shows, growth takes courage. To Harry, Ron is nothing less than a brother. To Hermione, Ron is a source of balance and an equal partner in caring for Harry. Ron is a constant companion and an anchor to his friends and family, through danger and through their most vulnerable moments. Though his insecurities sometimes get in the way, Ron’s loyalty is ultimately unwavering. He is a true companion until the very end. OWLs – What Wizarding Career Do You Want? Previous story Natalie Dormer to Narrate New “Harry Potter: A History of Magic” Audiobook!